More than 80 Ushabtis figures of 15 cm dated at least 3000 years ago have accompanied Djehuty,the ancient Egyptian priest, on his trip to the afterlife and was found by a research team led by Spanish Egyptologist Dr. José Manuel Galán. 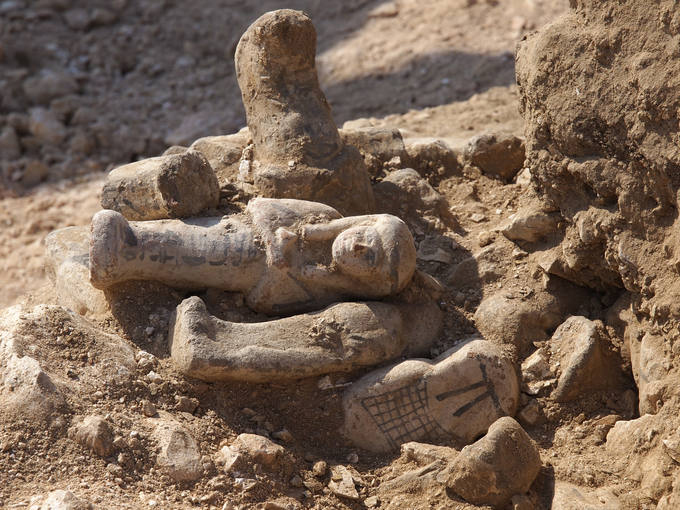 The researchers believe the Ushabtis found belong to the priest. The importance of this discovery because the tomb have been looted by grave robbers, yet they have been discovered completely intact. In the tomb of Hery, a senior Egyptian official who lived in 1500 BC, researchers have discovered a burial pit "completely inesperado - unexpected" in the words of Dr.Galan, and that the tomb had another cavity of these characteristics and is not unusual for having two burial rooms in tombs. As a result, Egyptologists have not been able to access the interior of this well, as they had to leave the country at the outbreak of the revolt in Egypt but archaeologists hope to enter the venue next season of the project, which will take place between January and February 2012. This burial chamber, archaeologists found two graffiti on the walls written in red ink with demotic characters (Egyptian cursive script) that are dated to the year 43 of Ptolemy VIII, equivalent to the years 128 and 127 BC. These discoveries were made in the context of Djehuty Project, which began last January and had to be interrupted in the middle of work because of the riots in Egypt. "It's designed like a city, streets are drawn around the graves, which are like townhouses" said Dr. Galán. “Under each site there are older strata, so the place is ideal for digging long term.” He added. "We could easily be 100 years with this project," José Manuel Galán has assured to discuss the future of the excavation. You commented that the findings are encouraging this year to continue finding monuments.